Regular oral examinations and oral cancer screenings play an important role in preventing the onset, progress, and recurrence of many dental diseases and conditions. According to research conducted by the American Cancer Society, almost 30,000 Americans are diagnosed with oral cancer every year. The key factor to successfully treating oral cancer as well as many other oral diseases is detecting and treating them in their early stages. However, in many cases the typical early signs and symptoms of the disease may go unnoticed or overlooked by the patient. That is what makes regular professional oral exams and oral cancer screenings critically important. 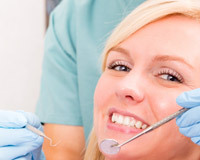 At Beverly Hills Dental Care our entire staff is committed to your oral and general health. In some cases, Dr. Keselbrener may also find it helpful to take some additional diagnostic X-rays, measurements, photographs, and impressions of your teeth for wax-up study models. Dr. Michael Keselbrener will then carefully evaluate all his findings and design a treatment plan, tailored specifically for your needs and expectations.